Birmingham / Bromsgrove / Tamworth are strategically in the heart of the UK and surrounded by major transport and distribution links, making it a popular location for warehousing and distribution facilities. Warehouse Storage Solutions have for many years been providing innovative, quality and low cost pallet racking solutions to hundreds of satisfied customers across the Birmingham / Bromsgrove / Tamworth area. Many companies reach a point in time when consideration has to be given to whether to decide whether to relocate or to extend the existing premises. Both of these options can be very costly indeed and cause huge disruption to the normal business activities. 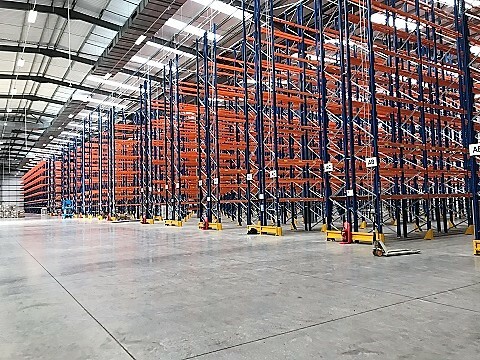 It is often the most cost effective to make better use of existing space rather than build or re locate, an innovative pallet racking solution creates far less disruption to normal business too. We have a wide range of customers from small businesses to major global players. We have an extensive team covering the Birmingham / Bromsgrove & Tamworth areas. We are very responsive to customer enquiries & requests for quotations. WSSL offer customers no obligation quotations & ensure you get the most suitable & cost-effective pallet racking solution possible. Furthermore we are able to take the lead in the project management from end to end to ensure on time delivery and within agreed budgets. Warehouse Storage Solutions – the UK’s specialist pallet racking supplier. The vast majority of new customers come to us via referrals from existing clients. Each project is individually tailored in order to meet your exacting requirements. Wide aisles for easy access. Best option for bulk storage. Pallets on rails “push back” up to a maximum depth of 6 pallets. Doubles the potential storage capacity. Requires handling equipment with long forks but is a really cost effective solution. Pallets on rollers which are slightly inclined. Gravity moves the pallets without the need for intervention. Perfect if stock rotation is critical, live pallet Racking is the one to choose. For those areas where dense storage is needed narrow aisle racking is optimal. Fork lift trucks enter the storage lane making the most out floor space and the available height. The ideal solution for outdoor storage. The metal is galvanised to make it weather proof. Thinking of a move or want to know how to get the best out of your existing storage? We offer no obligation quotations and are highly responsive.